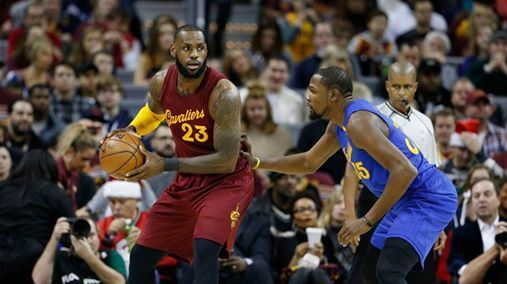 NBA – The most awaited match up of the defending Champion Cleveland Cavaliers and the 2014-2015 NBA Champion Golden State Warriors finally happen on Christmas Day (US Time). NBA fans and sports analyst may have the chance to see what could be the first glimpse of an NBA Finals rematch between the Cavaliers and GSW for the 3rd consecutive time. Despite it’s only a 1 game in the regular season it seems that it’s already a playoff game between these two teams that desperate to win the game, but this time the home town team Cleveland Cavaliers own the Warriors winning 4 of their last meetings dating back in 2015 – 2016 NBA Finals where the Cavs won their first ever NBA Champion and now this Christmas game win for the Cavs. The Warriors new addition from the team during the free agency Kevin Durant, a former MVP and one of the most prolific scorer of the league still not enough to beat the defending champion. Durant scores a game high 36 points, 15 rebounds and 3 assists, but failed to save the warriors from losing the game after tumbling down the floor in the dying seconds of the game. LeBron James scores a team high 31 points, 13 rebounds and 4 assist and Kyrie Irving scores 25 points, 6 rebounds and 11 assist to lead their team from rolling back in the 4th quarter despite being down by 14 points early in the 4th quarter. Meanwhile, Draymond Green made a basket to tie the game 105 - 105 while Stephen Curry made a three ball to regain the game lead for the Warriors 108 – 105 for the last time. Kyrie Irving, scores the last 4 points of the Cavaliers do what he did in Game 7 of the NBA Finals as he made the two clutch basket that give the Cavaliers 109 -108 win over archrival GSW. No Comment to " Cavs beat Warriors in a thrilling End Game of Christmas Day Special "